Day 3: the medical MacGyver, teaching & the possibility of clean water. Last night was one of those surreal nights here. I’ve heard Haiti often referred to as the “land of a million orphans” but there are moments when the weight of that statement hits you. 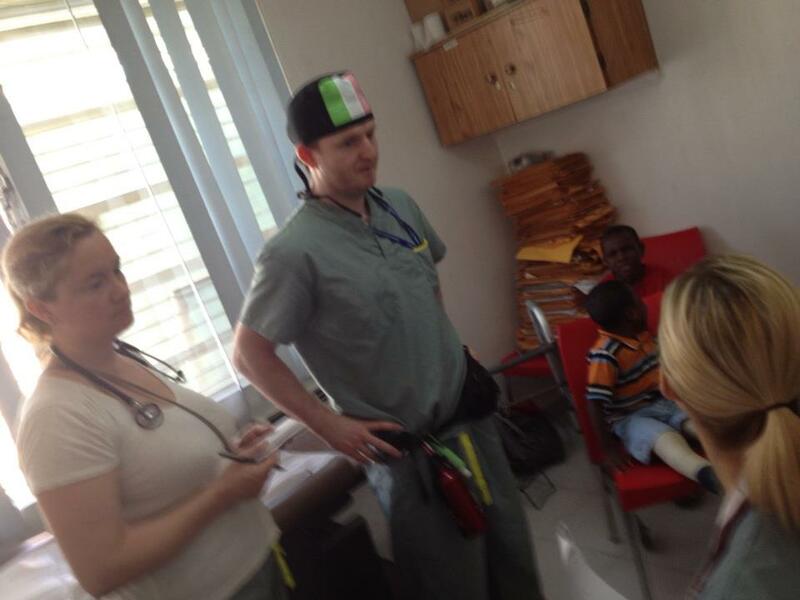 Late last night, Mary O’Brien, one of our pediatric nurses and Dr. Melissa Angel ended up treating an abandoned orphan. This little one was obviously terrified but it didn’t take long for her to realize she was safe now. Mary and Melissa comforted her and helped arrange the social work this morning. Take a moment and go hug your kids. Another busy day in pediatrics. Leigh Anne and Natalie diligently work away treating a variety of infectious diseases including meningitis. They haven’t stopped yet. It can be a real eye-opener, especially if it’s your first trip. Nurses Carla Pitman and Susan Morgan are in that boat. They’re driven by what they see. This place changes you. Humbles you as to how lucky we are in great north. Still missing his luggage, Patrick Clarke went all MacGyver on us. He helped fix the ultrasound, the anesthesia machine and the downed CT scan… all with duct tape and some LEGOs. Kidding. Pat-of-all-trades. 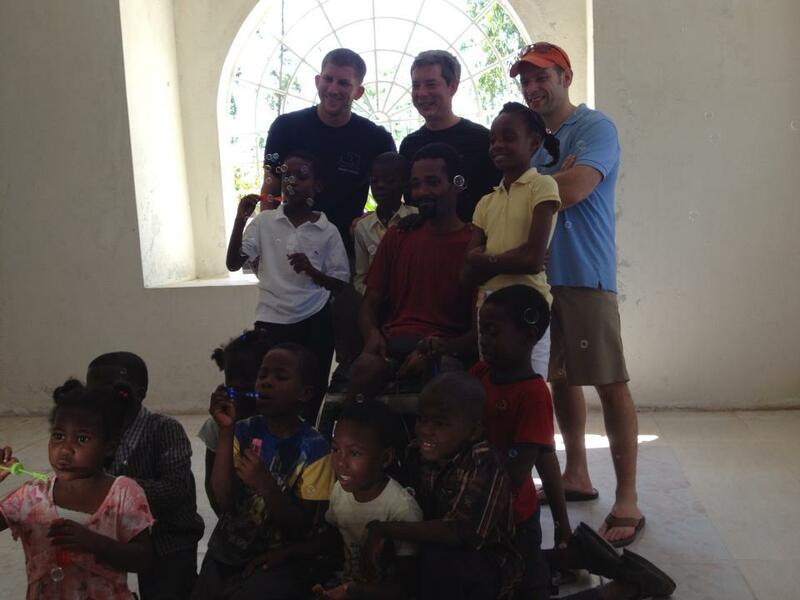 Spent part of the afternoon helping to teach Haitian medical students with the local ortho surgeons. These guys will change lives here. Tomorrow’s gonna be another big day. Thanks to our good friend Brendan Paddick, clean water engineers from Columbus Communications will be doing a site survey at the hospital for us. What a difference that’s gonna make. And tomorrow night the team’s been invited to a BBQ at the Canadian consulate. Nice little break there. Night’s coming on. It’s tough to think about what lies out beyond the walls of the hospital. Sadly, most nights we have to turn people away because we’re way beyond capacity. You end up feeling a little guilty but that drives you to do that much more the next day. Did nothing to cool this place down. Things are accelerating. Started the day off treating a femur fracture on a foreign worker to be evacuated out to the States. That kinda set the tone (no pun intended!). As with previous trips, we’ve been seeing a lot of kids. Pediatrics has seen three with HIV that came in from a local orphanage run by a group from Montreal. The number of orphans here is heartbreaking enough but to see these young ones fighting this kinda battle is that much harder. 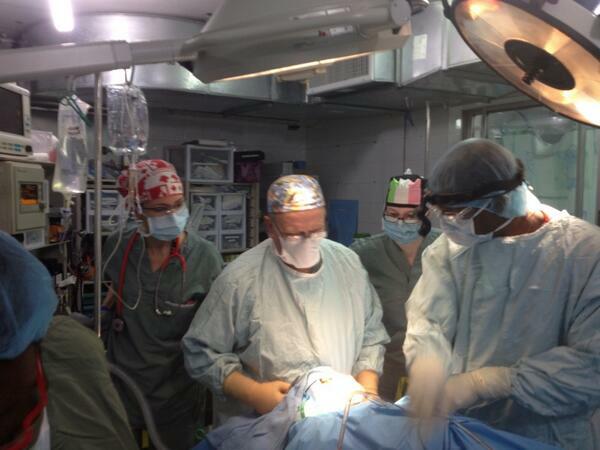 Art’s crew has assessed over 20 kids for surgery so that work’s just beginning. And Dave Jewer and a pediatric surgeon from the States removed a tumor from a child in a surgery that lasted over 4 hours. Luckily, the child is stable. In the ER, we’ve run into a challenge of having five patients admitted with only two beds available. Dr. O’Dea and crew are seeing more and more orthopedic cases than we can handle right now. Triaging. Do what we can do. And then do more. Physio hasn’t stopped at all. 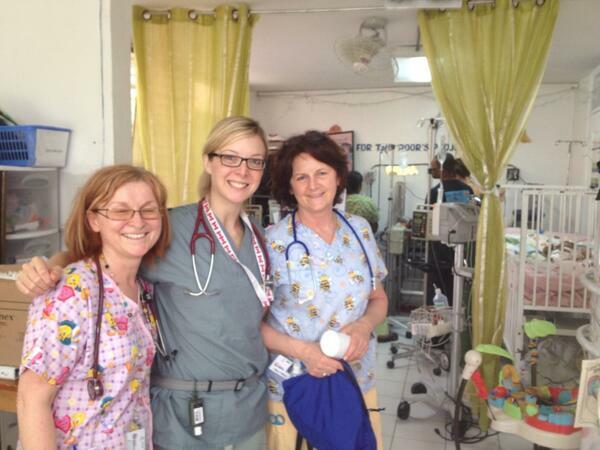 Karen is mobilizing patients, making room for even more. Somewhere in between, we all find time to unload and organize the crate of supplies donated by LeDrews Shipping, Exxon and Eastern Health. It’s kinda surreal seeing old equipment with Eastern Health labels on it being unpacked by folks from home. Bit by bit the hospital needs are being met. It’s a long road but we’re on it. I’m getting use to the long flight. The bags of supplies and that drive from the airport to the hospital in Port-au-Prince that serves as a reality to check as to where we are. We landed and got settled by 7 pm last night and right away the doctors and nurses kicked into action. Local staff know us well by now and it’s like seeing old friends. Hugs all round. Overnight, another reality check of where we are. One gunshot wound. One stabbing requiring the emergency team’s quick attention. The day starts early with a trauma. Nurses prep for surgery to fix a broken femur and tibia. Later, myself and Dr. Rideout make a house call to a patient with a spinal chord injury. We know him. His name is Cator. We first treated him back in November, 2011. 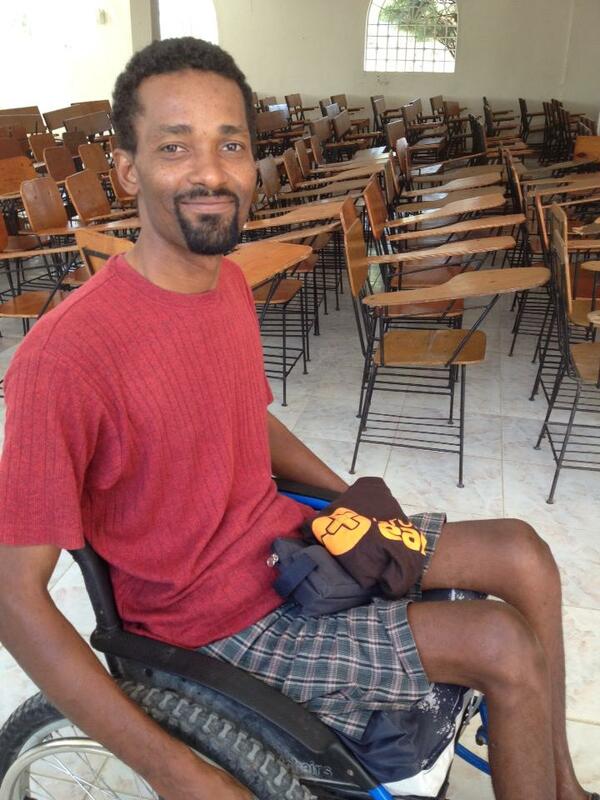 He’s been through rehab and is an active member of Project Stitch where he can provide for his family. I can tell by the smile on Art’s face that this alone made the trip for us. We need more stories like this. Back at the hospital again. Peds is busy treating patients with infectious diseases. It’s gonna be a busy week. Missing the family. Missed Great Big Sea last night. Keep thinking about Cator. Makes it all worth it.